Powered by the Iridium NEXT low-Earth orbit satellite constellation, Iridium Certus is a new multi-service communications platform set to disrupt the industry-status quo by bringing a more efficient, reliable and cost-effective way to achieve 100 percent global connectivity. With uncompromising coverage and speeds reaching up to 1.4 Mbps, even in the most remote areas of the Earth, Iridium Certus will deliver enterprise-grade services while redefining the limits of mobile satellite communications. Iridium Certus is being built to support an innovative portfolio of partner products and satisfy a wide-ranging set of aviation, maritime and land mobile communication needs. The multi-service platform will provide users with the voice, data and broadcast options they need to meet the ever increasing demands of field communications. Whether your application is large or small, high-speed or low-speed, Iridium Certus can be used to deliver the right service for your business needs. Iridium Certus will provide peace of mind that your operational needs will always be met. With exceptional availability and fully scalable high-performance solutions, Iridium’s reliable, global network will ensure that your mission- and business-critical capabilities are supported. Iridium’s service offerings will also grow with your business over time. Through an array of best-in-class terminals, Iridium Certus will accommodate a full range of services – streaming data, high-quality voice, data broadcast and safety services – all built on a single platform. If you expand into new regions, increase your volume of users, or need higher data speeds to support your applications, Iridium Certus will scale with your enterprise to ensure you have the right solution at the right time. 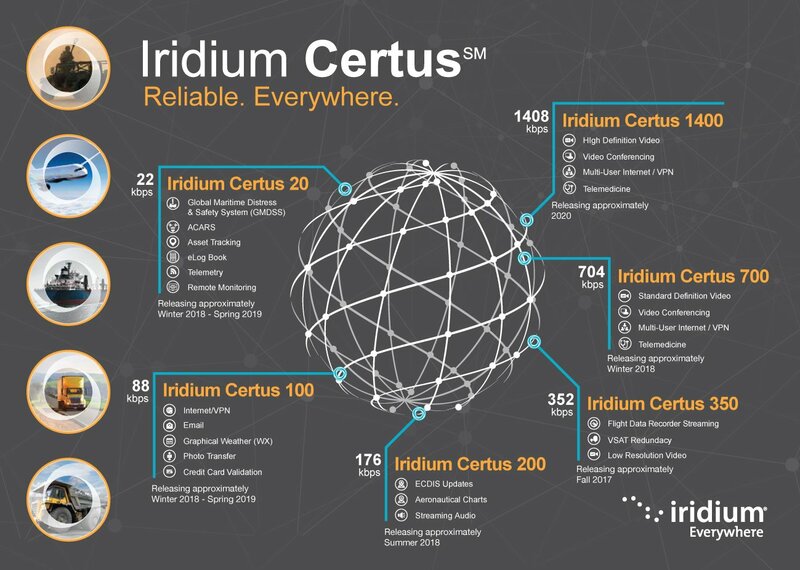 Iridium Certus is the new multi-service platform powered by the $3 billion Iridium NEXT constellation. With uncompromising coverage and a range of speeds eventually up to 1.4 Mbps, Iridium Certus will deliver global, reliable, enterprise-grade services while redefining the capabilities of mobile satellite communications. The unique overlapping architecture of Iridium NEXT will provide availability, redundancy and reach no others can match. Unlike distant geostationary satellite networks that limit geographic use and are subject to service degradation in inclement weather, Iridium Certus operates from a network of 66 low earth orbiting satellites that provide service anywhere on the planet, even in poor weather conditions, without compromise. Iridium® stands alone as the only truly pole-to-pole satellite network. Through a crosslinked and overlapping “mesh” architecture, Iridium’s global coverage means that you are never out of reach, regardless of your location. Using this powerful network as the backbone for service, Iridium Certus is poised to set the standard for remote communications and connectivity for enterprises, governments and individuals that want to extend their use of mobile networks into remote areas.